My sweetheart & I drove to Temecula on Friday to visit the girls at La Maison Rustique and although I didn't return home with a large haul, it was a beautiful day and I got to see some girlfriends whom I have not seen for quite some time. He asked "what are you going to do with 3 butter knives?" and I replied, "my treasures don't serve a practical purpose, they serve "my purpose". I guess he will have to make a few trips to the barn with me before he fully understands my flea market mentality huh? (Come on girls, I know I am not alone on this one). 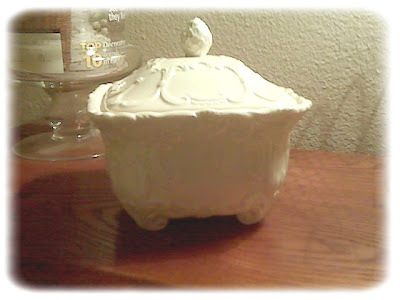 Found this beautiful covered dish at Serendipity in Old Town Temecula. The lady said it was a "tea caddy" and the cost was $12.00. I think it was worth it. 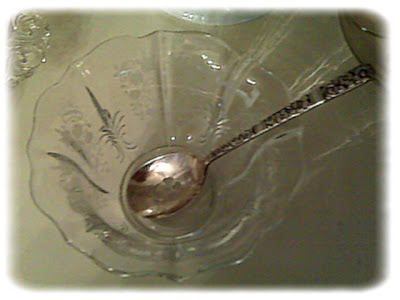 Now the conversation piece of our day was this silver bon bon spoon. 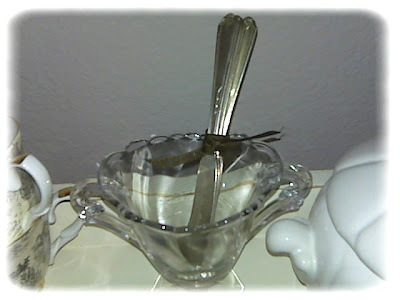 I saw it, I wanted it and at the cost of $4.00 I felt that even if I never serve bon bons from it, I must have it to display with my other silver pieces. 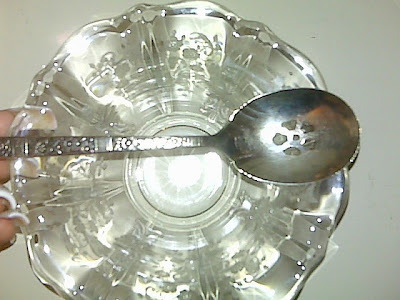 My sweetheart was baffled by the very idea of being served bon bons one at a time from a spoon with slots in it, I explained to him that proper etiquette requires one to enjoy a small taste of a fine confection rather than over-indulge in a box of See's Candy. Nice to be back to blogging. Thank you for your comments. SO nice to see you again. I have missed you. Love this post and I can so relate. The bon bon dish is beautiful. Sounds like the perfect day. Have a great week and good luck in my giveaway. Was sooo happy to see you and give you a hug and meet your man!!! He 's so sweet and cute....hopefully we'll get to chat longer girlie!! I like those butter knives. It's so good to see you back blogging and to see you looking very refreshed. Hi...I'm new to blog and havbe really enjoyed reading it and seeing the pictures of all of your goodies! Come by my blog and say HI! !